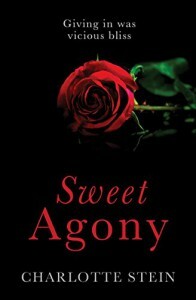 Sweet Agony is another of Charlotte Stein's awkward, neurotic-voiced stories of halting romance and sexuality. It starts with Molly, a young woman who's in desperate need of a job, climbing a fence to deliver an application to Cyrian, an enigmatic, persnickety, peculiar future-employer. (*cough, very similar to Benedict Cumberbatch's portrayal of Sherlock Holmes.) He hires her to be his housekeeper without showing her his face. It starts with a gothic tone--on the creepy side--but moves toward Molly thawing the ice that surrounds Cyrian. It is wicked, naughty, and evolves into a sweet and filthy love story. I adore Stein's voice. This will likely become one of my favorites--not just for the BC references--but also because she skillfully combines anxious/awkward moments with steam and manages to break my heart a little too. So, so good!